This weekend it's the opening of the Liverpool Biennial, so if you're even the tiniest bit interested in contemporary art, go check it out sometime in the following ten weeks. The really great thing about the biennial is that so much of the work is in public places, and pretty much all of it is free. The Biennial website should be your first stop when planning a visit, it's got all the maps, schedules and descriptions you could want, but the excellent Art in Liverpool blog is a good place to muck about, too. The biennial has also an extensive fringe, called the Independents Biennial, which is heavy on Northwest artists and has all kinds of far out stuff going on, from phantasmagorical surreal cabaret to sound art installations in flaming tunnels. Unfortunately, it's pretty hard to figure out what's on when because the independents website has bizarrely been set up as an unsearchable forum, and it's almost impossible to find a specific event, except by accident. Why is there a picture of Bootsy Collins up there? Grizedale Arts are bringing Bootzilla and Bernie "Woo" Worrell to Liverpool for the Biennial is what I heard. Oh yeah. 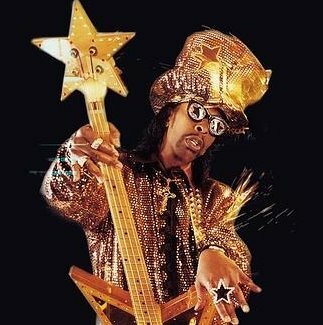 Update: Bootsy pulled out at the last minute. Boo.